When we moved back to the UK from the Isle of Man we decided on a house on the outskirts of Crewe in Cheshire. In fact it is as near to Nantwich as Crewe but the postman says Crewe. One big factor against the house we bought was the modern house garden – 60 feet long and 25 wide. But 100 yards away at the end of the road was an allotment site…. The site, Wistaston Green, contains 41 plots, most of which are occupied. The site is reasonably sheltered with houses to two sides, a road to one and trees to the fourth side. There is no vandalism problem to speak of although we did have a small problem with some youngsters in 2004. We’re a little more vigilant now about strangers on the site and tend to lock the gate even when on site. The soil is very heavy clay with a layer of lifeless orange clay someway under the surface and some plots tend to get very waterlogged. Like most clay soils it tends to be acid so liming really helps get the best out of it. My two plots are nearly opposite each other with the path in between . My plots, like most on the site, are orientated in an east – west direction. There’s an eclectic mix of people on the site – from youngish couples to the retired with a mix of social groups. Some plots are really well looked after and some not – mine fall in the middle, I’m afraid. The first plot I took on was plot 5. It was covered in grass and weeds although it had not been vacant for long. It doesn’t take nature long to convert a vegetable garden to a bed of weeds. I didn’t really have much idea of what had been grown where before or how the previous tenant had tended the soil. It was, as I was to discover, heavy land. The topsoil is around a foot deep to eighteen inches with a pan of solid orange clay below. I’m gradually deepening the topsoil and improving it. I divided the plot into beds separated by narrow paths made of wood chippings, eventually added a shed and built compost bins and a leafmould cage. 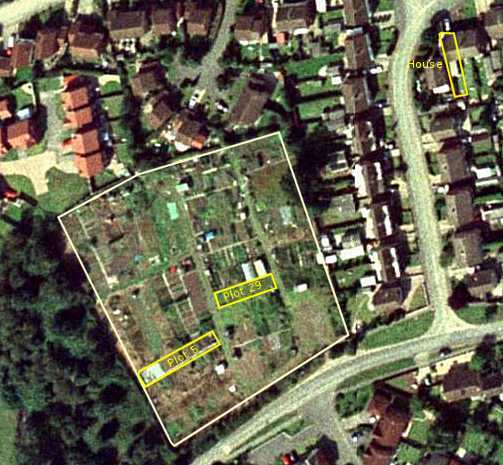 Having gained control of plot 5 and realised I was tight for space – many allotments are larger than these – I took on plot 29. The previous tenant had two adjoing plots and had sheds, greenhouse, deep beds and lots of chippings on the surface. So I inherited some lifeless soil where the buildings had been, which had some sand and gravel on it as well as the deep beds. Unfortunately, I also inherited marestail all over the eastern end of the plot! The soil was not in brilliant condition having been run on a no dig system for a few years but without the addition of loads of compost required by a no-dig system. It is level and being in the centre of the site (a dogleg to the east from plot 5) much less prone to waterlogging. 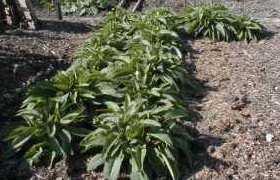 It is divided up into four normal soil beds, two large deep beds and 3 small deep beds. After 8 wonderful years on the allotments we moved on to pastures new. Some 30 years ago we honeymooned in North Wales around the Llyn peninsular and fell in love with the area. We’ve also always wanted a place with some land and finally we’ve achieved our dream. Four acres on a Welsh hillside. I was very sad to say goodbye to the plots, they’ve been the centre of my life for years. Not just a bit of land but a community and an anchor. I’m happy that whoever is growing on them now has better soil to start with though. 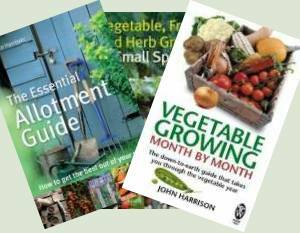 There’s a page about our smallholding here.